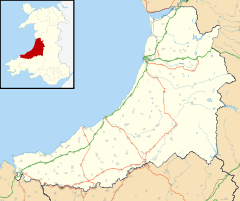 Llanarth is a small village and community in Ceredigion, Wales, located on the A487 between Aberystwyth and Cardigan within three miles of both Aberaeron and New Quay. Llanarth has a petrol station, post office, a primary school, a public house, a butcher, a Spar convenience store and a garden centre. The parish church of St David's, once dedicated to St Fylltyg, is a Grade II* listed building. It was renovated in 1872. A stone in the churchyard is sometimes pointed out as bearing the Devil's footprint. According to legend, he was trying to steal one of the church's bells one night, but woke the vicar, who drove him off. He left the footprint as he fled. Dafydd Jones, Welsh rugby international and Llanelli Scarlets player was brought up in Llanarth. Daniel Lewis Lloyd, Bishop of Bangor, is buried in St David's churchyard, Llanarth. ^ "Community and electoral ward population 2011". Retrieved 11 May 2015. ^ "Church of Saint David, Llanarth". British Listed Buildinds. Retrieved 18 December 2013. ^ "Llanarth tourist information". WalesDirectory.co.uk. Retrieved 20 August 2014. ^ Dafydd Jones at BBC Mid Wales, September 2006. Accessed 22 October 2012. Wikimedia Commons has media related to Llanarth, Ceredigion. This page was last edited on 20 March 2019, at 13:01 (UTC).